That is exactly what many of our ancestors did during the 19th century, left their traditional hometowns along the east coast or the Great Lakes area to travel to a new, mostly uncharted part of the country – the far west. It was a way to start fresh for many individuals and families. The covered wagons were the main source of transportation in the first half of the 1800s and later when trains and tracks were sent west, that was the method of transportation. One of the most important early trails westward was the Oregon Trail. It is a 2,170-mile trail that led pioneers across the North American continent to the West Coast. Fur traders, explorers, gold miners, and pioneer families all used and helped develop the trail over a period of several decades into the mid-19th-century. The starting point of the trail was just outside of St Louis, Missouri, on the west side of the Mississippi River. The Oregon Trail led travelers through what are now Kansas, Nebraska, Wyoming, and Idaho, and into Oregon. The beginnings of the trail were laid by fur traders and trappers beginning in about 1811, though it was a primitive trail then, and only able to be traveled on foot or horseback. 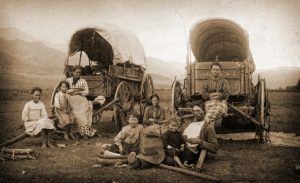 When the first organized wagon train of pioneers migrating out west in 1836, a wagon trail had been cleared by those early fur traders and explorers all the way to Idaho. As the trail became used more and more by wagons and migrating families, costing for a wagon and oxen / horses about $400 to $600 per family, the trail was expanded to make it wagon-friendly all the way into Oregon. It eventually reached Willamette Valley in Oregon, where the trail ended. Not every traveler going out west was looking at Oregon as a destination. Some wanted to settle in Wyoming, Colorado, Idaho, Montana, and other western territories. To accommodate them, offshoots to the trail were made. During the years where the trail reached its peak use, approximately 400,000 people of all kinds traveled the trail. These people were families, businessmen, farmers, ranchers, and miners. Some people even traveled the trail to set up businesses to sell provisions to others who were traveling the trail. Usually the travelers averaged 15 miles a day, so those going all the way to Oregon spent 4 to 6 months on the trail. Yet, it could be dangerous also, death from spoiled food, illnesses, wagon accidents or drowning from crossing rivers. 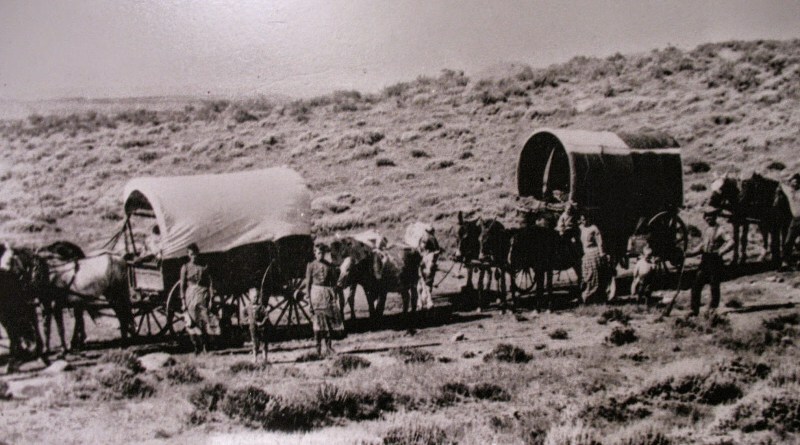 With the 1869 transcontinental railroad open, traveling in wagons on rough roads was not a popular. So either via the Oregon Trail or any of its off shoots or by railroad, you may well have ancestors who left the eastern part of the country to head and resettle out west. To help find out, check where different relatives were born and lived or died and when. If a child was born in Colorado about 1850, more than likely the family had traveled the Oregon Trail and the baby was born along the route. See if anything is written in family Bibles or in any letters or journals. Follow a family’s path of residence from the Federal census every ten years. There were also censuses done for these places when they were still territories and many have a question of where the person originated from. Discovery of a family’s migration within America can be fascinating especially if you do further research into what life was like for the wagon-train methods of travel. Photos: Wagon trains westward, Oregon trail route and family traveling west.